Rise and Fall, Camera Lens Movement. Lens rise and fall movement was very commonly fitted to folding cameras from the 1900s until the end of the 1930s. Apart from allowing a camera to be folded into a smaller space, the flexible nature of the bellows allows the lensboard to be moved off axis to reduce the effect of convergence when photographing, say, tall buildings from ground level. A contemporary Kodak manual from the 1920s suggests the best way to photograph tall buildings is to enter another building across the street, and climb up until you are about half way up the height of the subject building, to avoid distortions. Very helpful, I'm sure. The alternative is to use the "Rise and Fall" movement that many cameras of the era were fitted with, as epitomized by the Sanderson cameras originally created with this in mind. 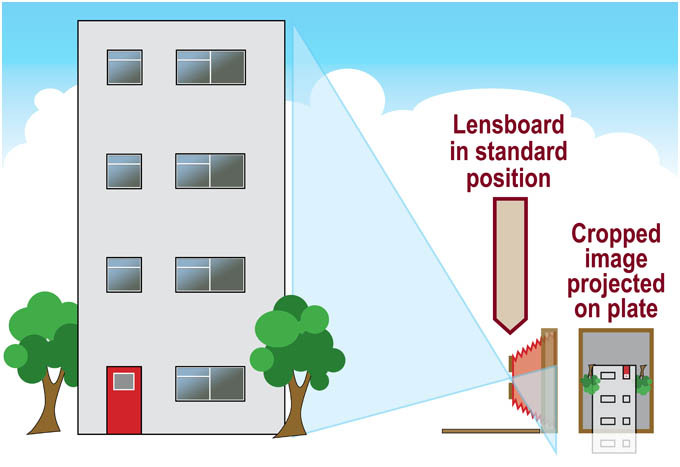 The lensboard is arranged so that it can be unlocked and moved vertically, this meant that the camera's focal plane could be kept parallel to the target, but the top of the building still be in shot, by doing this the verticals in the building remain parallel - false of course in it's own right, but desirable to the architectural photographers of the day. Sanderson cameras also allowed the lensboard to tilt, allowing the centre of the lens to be used, as this is the most optically efficient part of the glass, and helped prevent image cut off caused by the lens barrel construction and allowed the plane of focus to be shifted. Most of the smaller cameras only had the rise component fitted though. These movements are all but extinct in modern cameras, save the last few studio monorail cameras soldiering on the the world's photographic studios. Below are three diagrams which simplify the theory. For those of you that are not familiar with the way a lens works, bear in mind that all cameras, even the one in your mobile 'phone, projects the image upside-down inside the camera. 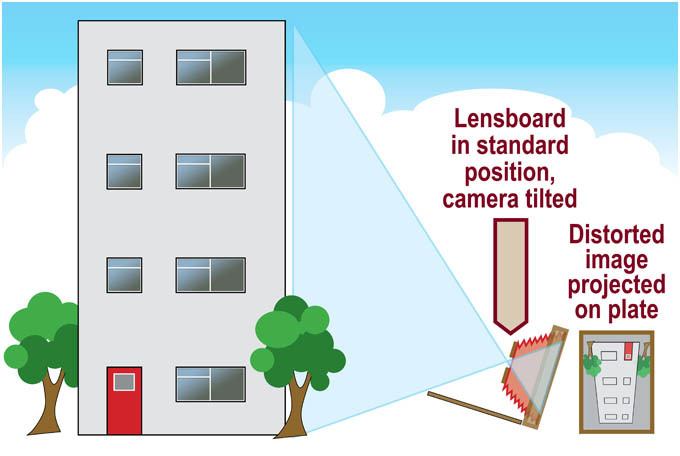 In this diagram, the simplified camera has been placed at ground level in order to take a photograph of the building. Two lines are drawn, one shows the path of a ray of light from the base of the building to the point it arrives at the photographic plate, the other indicating the path of a ray of light from the top of the building. Every point in between is covered by filling in the space between these paths with light blue, forming the two triangles you see here. In this example the problem is readily apparent, we can't get the top of the building in shot, as the rays from the top of the building have, in theory, been projected beyond the bottom of the camera's plate. The building will be cropped off. The obvious solution is to angle the camera up, and that's what we all tend to do these days. 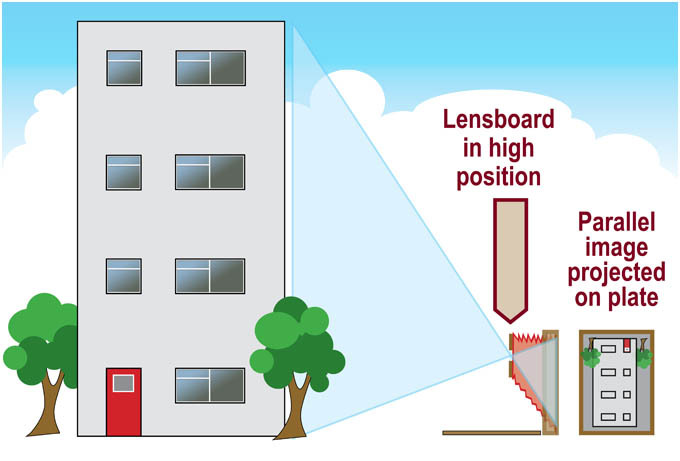 So, in this diagram, the camera has been angled up to get the top of the building in frame. The image that is projected onto the plate now includes the whole of the building as intended, but has verticals that lean in markedly. There are two factors that are responsible. Firstly, the natural effect of perspective, as things get further away, they appear smaller - this is entirely normal, and ordinarily we expect a camera to record reality as far as possible. But the camera compounds the perspective due to it's construction, making the verticals converge much more. Look at the two blue triangles formed by the lines representing the rays of light from the top and bottom of the building. They are not the same shape. In geometrical terms, they are said to be not "similar". They are both triangles - true, but the ratios of the lengths of their sides has not been preserved by the camera, and it is this that leads to the magnified perspective. Luckily for us, the camera is fitted with lens rise. By keeping the camera level we can unlock the lensboard and shift it up, until we can see the whole of the building is projected onto the ground glass focus screen - which is the reason why these old plate cameras have such things, the ability to focus and inspect the image exactly. Look at the triangles formed by the light rays, they are geometrically "similar". That is the ratios of their sides are preserved exactly, and this results in an image with true verticals. There are a couple of things to bear in mind, particularly with the larger formats. 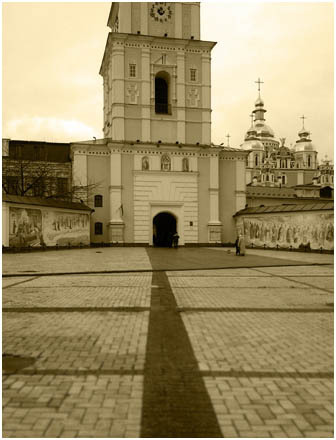 The focus across the focal plane will not be constant, but generally, buildings are photographed from a fair distance, maybe close to infinity from a focus scale point of view. So the lens will be close to it's maximum depth of field, which helps, but using the smallest aperture you can will keep the image sharp. And it was for this reason that tripods were a vital piece of equipment in architectural photography. The photographer could choose to either remove all the distortion, or remove it partially to produce a more natural perspective by using a mix of angling the camera up and balancing the convergence with lens rise. These next three images show the practical application of the Rise movement, fitted to many pre 1940s cameras - but rarely thereafter. 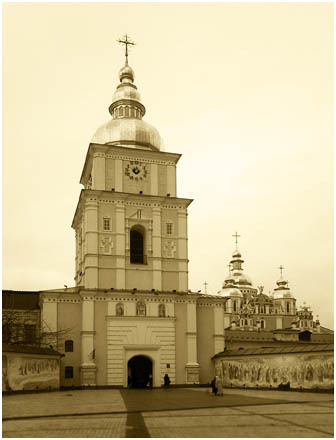 The subject in this case is St. Michael's Cathedral in Kiev, Ukraine and was photographed in 2017. For this image, the camera has been set up on a tripod, focussed just short of infinity, the camera is level, and the rise movement left neutral - as per the first diagram above. Naturally, we can't get the top of the structure in. Even though there's plenty of coverage, given the amount of pavement in the foreground. However, if you look at the vertical lines, they remain parallel. Natural perspective as indicated by the pavement is treated in a natural and realistic way. The depth of field at the aperture used isn't enough to keep the nearest pavement slabs sharp, which is just something you need to live with when using longer focal length lenses. For this image, the camera has been taken off of level and angled up, by shortening one of the tripod struts - as per the second diagram above. St. Michael's isn't massive, but it's representative of the sort of building the Sanderson cameras and their ilk were expected to encounter in their day. Here you see the characteristic converging verticals, partially natural perspective and partly exaggerated by the camera. The result is an ugly image, suggesting the building is falling over backwards. To some extent, it is possible to remove some of the distortion during printing, by angling the paper and using a tiny stop. For this image the camera was set back to perfectly level, but the top of the image was brought into frame by raising the front lensboard - as per the third diagram above. 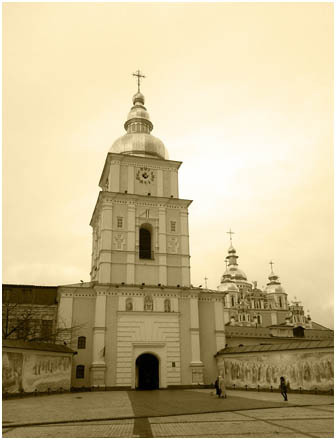 An adjustment to the aperture, one extra stop and a consequential increase in exposure time. But maybe a shade too much as the sky is a bit overexposed, however - for these purposes it will do just fine, and I can always "burn" the sky in a later print if I feel the urge. Here the verticals are preserved as parallel, well nearly, just a little convergence to hint at perspective remains. The natural perspective in the paving slabs is still realistic, but the depth of field has suffered in the foreground, even with the one stop smaller aperture. So that is the perceived wisdom of the time for shooting taller buildings. In the main these days, we tend just to angle up and except the convergence, or put on a wide angle lens and marvel at our curvaceous results.